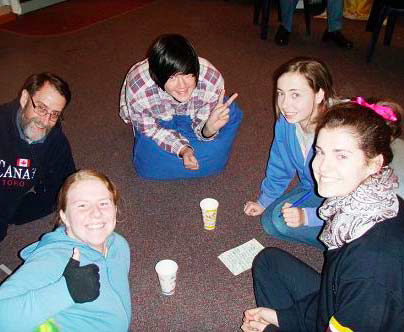 On Friday the 29th July, students and teachers from Galen Catholic College slept out in the school auditorium to raise awareness of and show solidarity for the homeless in the Wangaratta vicinity and to raise money for St Vincent de Paul. The event was organised by two year 12 students, Isobel Tait and Maddie Burder. The organization of this event fulfilled part of their religion class requirements and was evidence of their keen passion for social justice and their desire to make the winter sleep out an annual event. “It’s a great way to get younger kids involved in social justice. As students who did this in the past, Maddie and myself wanted the younger students to have the same experience that we did”, says Isobel Tait. Students participated in quizzes, improvised songs, decorated boxes and drew their homes and families. Having to rub out thier drawings after explaining it’s importance provided a powerful message for participants, as it helped them to understand the perspective of a homeless person. Guest speakers from St Vincent De Paul discussed their role in the community and how Vinnie’s works as a business and a community help centre which extends beyond the shop most are familiar with. Students left more informed and some were left wondering if they could help in other ways. The screening of ‘Pursuit of Happiness’, starring Will Smith, provided excellent food for thought before participants moved off to their personal box to sleep on. Many donations for the night came from the local community including all of the food for the night and breakfast the next morning and the girls would like to extend a special thankyou to everyone who helped out. The girls remarked “it was fantastic to see so much community interest and support” and expressed their gratitude to those who donated food for the night. The following morning, the night’s events were hot on everyone’s lips as teachers and students alike packed up their box and sleeping bags and headed off. The student organisers would like to thank those who helped create the successful night: Deputy Principal-Catholic Identity, Mr Paul Maher; youth counsellor, Ms Therese Rodway; Principal, Mr Bernard Neal and Social Justice and Community Service teacher, Mrs Fiona Neal as well as many other friends and family members.